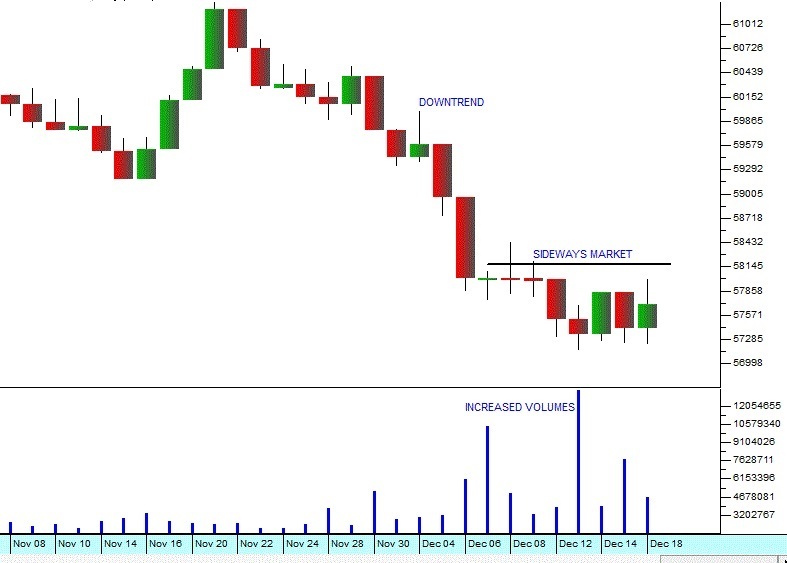 When the volumes traded in a share start to pick up while the share price moves sideways or upwards, this is known as an “accumulation phase”. It indicates that the share is becoming stronger. After a period of accumulation, the supply of shares will sooner or later be exceeded by the demand and this may send the share price shooting upwards rapidly. An accumulation phase is a sideways market where the smart money is accumulating the share because they expect it to rise in due course. You can see in the above chart that the share falls and then enters a period of sideways movement, which is associated with increased volumes traded. The raised volumes are caused by smart money accumulating the share. It is sometimes also called an “island” and it is the opposite of a “distribution area”.